Functionalizing nanopores with responsive polymers allows to switch ionic transport on and off using various stimuli such as pH, light, potential, ions, etc.. This effect is based on pore sizes being in the range of the Debye-Screening length allowing to electrostatically prevent ions to access nanopores of identical charge. J. S. Tuninetti, M. Rafti, A. Andrieu-Brunsen, and O. Azzaroni, “Molecular transport properties of ZIF-8 thin films in aqueous environments: The critical role of intergrain mesoporosity as diffusional pathway”, Micropor. Mesop. Mater., 220, 253, (2016). J. Elbert, F. Krohm, C. Rüttiger, S. Kienle, H. Didzoleit, B. N. Balzer, T. Hugel, B. Stühn, M.Gallei*, A. Brunsen*, “Polymer-Modified Mesoporous Silica Thin Films for Redox-Mediated Selective Membrane Gating”, Adv. Funct. Mater., 24, 1493, (2014). A. Brunsen, Carolina Díaz, Lía I. Pietrasanta, Basit Yameen, Marcelo Ceolín, G. J. A. A. Soler-Illia, O. Azzaroni, “Proton and calcium-gated ionic mesochannels: phosphate-bearing polymer brushes hosted in mesoporous thin films as biomimetic interfacial architectures”, Langmuir, 28, 7, 3583, (2012). A. Brunsen, J. Cui, M. Ceolín, A. del Campo, G. J. A. A. Soler-Illia, O. Azzaroni, “Light-activated gating and permselectivity in interfacial architectures combining ‘caged’ polymer brushes and mesoporous thin films”, Chem. Commun., 48, 1422, (2012). We systematically investigated potential and limits of polymerization control mainly using iniferter-initiated polymerization and ring-opening metathesis polymerization (ROMP) in confined space to gradually adjust polymer density and with this charge density and ionic permselectivity in nanopores. We are able to gradually tune polymer density and thus charge density and nanopore transport. We could show that this can be used to gradually tune molecular pre-concentration in mesopores which e.g. can again be used to synthesize catalytically active NP in mesopores. 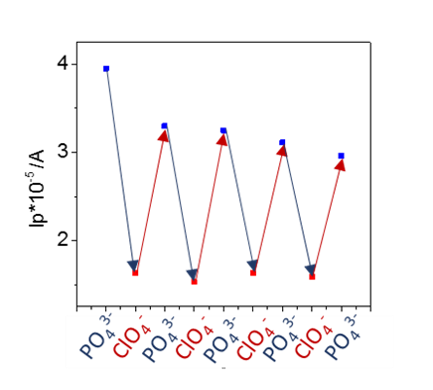 Depending on the monomer used complex transport phenomena such as bipolar pores in case of zwitterionic polymers can be designed. Finished Projects: LOEWE “Soft Control”, Fonds der Chemischen Industrie, Boehringer Ingelheim Stiftung. Formerly involved team members: L. Silies, F. Krohm, Dr. J. Tom. L. Silies, H. Didzoleit, C. Hess, B. Stühn, A. Andrieu-Brunsen “Mesoporous Thin Films, Zwitterionic Monomers & Iniferter-initiated Polymerization: Polymerization in Confined Space”, Chem. Mater., 7, 1971-1981, (2015). A. Andrieu-Brunsen*, S. Micoureau, M. Tagliazucchi, I. Szleifer, O. Azzaroni, G. J. A. A. Soler-Illia*, “Mesoporous Hybrid Thin Film Membranes with PMETAC@Silica Architectures: Controlling Ionic Gating Through the Tuning of Polyelectrolyte Density”, Chem Mater. 27, 808-821, (2015). F. Krohm, H. Didzoleit, M. Schulze, C. Dietz, R. W. Stark, C. Hess, B. Stühn, A. Brunsen, “Controlling Polymerization Initiator Concentration in Mesoporous Silica Thin Films”, Langmuir, 30, 369, (2014). M. Rafti, A. Brunsen, M. C. Fuertes, O. Azzaroni*, G. J. A. A. Soler-Illia*, “Heterogeneous Catalytic Activity of Platinum Nanoparticles Hosted in Mesoporous Silica Thin Films Modified with Polyelectrolyte Brushes”, ACS Appl. Mater. Interf., 5, 8833, (2013). Many technical processes are majorly influenced by mutual depending wetting/dewetting- and transport-properties e.g. in printing and coating industry or in micro fluidic or Lab-on-a-Chip-technology. The fundamental mechanisms of the mutual influencing of wetting- and transport-processes are mostly not understood up to date, especially if simultaneously to the impulse- additional heat- and/or molecular transport-processes occur. An even larger research gap exists if complex fluids (e.g. suspensions) and/or complex surfaces (e. g. porous) are considered. In order to investigate the mutual dependency of wetting- and transport-properties of mesoporous thin films and to achieve a control of pore accessibility, the wetting properties need to be gradually adjustable and/or switchable. Within the DFG funded collaborative research center SFB 1194 we systematically investigate the correlation of nanopore wetting and molecular transport. Especially looking at selective transport or sensing ligand binding is essential. For example we observed ligand binding between strong polyelectrolytes and different ions to be the determining factor for the observed changes in surface characteristics such as wetting and nanopore accessibility. Depending on the present type of ion nanopore accessibility can be modulated and pores can even be closed. These experimental observations could be confirmed and tracked down to ligand binding constants using molecular theory by Dr. E. Gonzalez-Solveyra in the group of Prof. I. Szleifer (Northwestern University, USA). L. Silies, E. Gonzalez-Solveyra, I. Szleifer, A. Andrieu-Brunsen, Langmuir, 2018, accepted.